Youth Alive Uganda (YAU) was started by a group of youth under the guidance of Sr. Dr. Miriam Duggan in Kamwokya, a Kampala suburb which was severely affected by a diversity of social and health problems, chief among them HIV&AIDS. The group realized that the most infected and affected were youth; mainly adolescents and young adults. In response, a youth friendly HIV prevention strategy was designed resulting in the foundation of YAU. Over the past 7 years, Youth Alive Uganda has integrated her youth programs to include health, livelihood, Human rights, and skills development to address evolved youth needs. We believe that young people and the entire communities have the inherent capacity to change attitudes and behavior. The power to fulfill this capacity is often denied or is not exercised. This power must now be recognized, called forth and supported from within and without. This will enable young people to initiate change and sustain behavior that promotes a healthy state of mind, body, spirit and environment. A critical component in this process is a supportive response to the most vulnerable young people. We recognize that change of attitudes, perceptions and beliefs at individual and community level in the present health, social and economic environment is a complex and an ongoing process. It is inextricably linked to such basic human values such as care, love, faith, family and friendships, respect for people and cultures, solidarity and support. 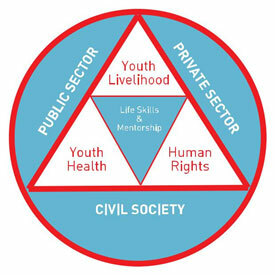 The present social, economic, political and health environment affects all young people. Our experience working with and through young people proves that behavior change is possible. We believe that behavior change is the most essential strategy in overcoming the current youth quandary.